One of the first decisions in any pattern recognition system is the choice of what features to use: How exactly to represent the basic signal that is to be classified, in order to make the classification algorithm's job easiest. Speech recognition is a typical example. Through more than 30 years of recognizer research, many different feature representations of the speech signal have been suggested and tried. The most popular feature representation currently used is the Mel-frequency Cepstral Coefficients or MFCC. 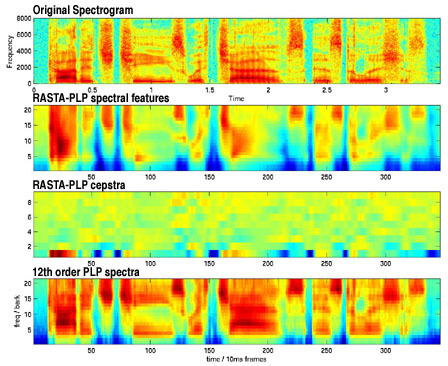 Another popular speech feature representation is known as RASTA-PLP, an acronym for Relative Spectral Transform - Perceptual Linear Prediction. PLP was originally proposed by Hynek Hermansky as a way of warping spectra to minimize the differences between speakers while preserving the important speech information [Herm90]. RASTA is a separate technique that applies a band-pass filter to the energy in each frequency subband in order to smooth over short-term noise variations and to remove any constant offset resulting from static spectral coloration in the speech channel e.g. from a telephone line [HermM94]. RASTA-PLP is implemented in a number of programs, such as the 'rasta' program, and its enhanced version 'feacalc', which are distributed for Unix as part of the SPRACHcore package. In order to understand the algorithm, however, it's useful to have a simple implementation in Matlab. By using Matlab's primitives for FFT calculation, Levinson-Durbin recursion etc., the Matlab code can be made quite small and transparent. Mike Shire started this implementation in 1997 while he was a graduate student in Morgan's group at ICSI. I have recently revised and extended his implementation to allow both spectral and cepstral outputs, and to allow independent selection of RASTA and/or PLP processing. This implementation offers only a few control parameters, namely a switch to select or disable rasta filtering, and an option to set the order of PLP modeling (which disables PLP modeling when set to zero). Other important options, such as the basic window and hop sizes, can easily be altered by editing the relevant routines, if desired. Since Mel-frequency Cepstral Coefficients, the other really popular speech feature, involve almost the same processing steps, I decided to make an implementation for them as well, using the same blocks as far as possible. See below. Sometimes it's interesting to `listen' to what it is that the cepstral representations are really capturing. You can do this, crudely, by recovering the short-time magnitude spectrum implied by the cepstral coefficients, then imposing it on white noise. The routine invmelfcc below does this (actually, it can do it for both MFCC and PLP cepstra, depending on the options you give it). melfcc.m - main function for calculating PLP and MFCCs from sound waveforms, supports many options - including Bark scaling (i.e. not just Mel! but cannot do rasta). invmelfcc.m - main function for inverting back from cepstral coefficients to spectrograms and (noise-excited) waveforms, options exactly match melfcc (to invert that processing). powspec.m - calculate the short-time power spectrum, basically a wrapper around Matlab's specgram. audspec.m - map the power spectrum to an auditory frequency axis, by combining FFT bins into equally-spaced intervals on the Bark axis (or one approximation of it). fft2barkmx.m - function to create the weight matrix that maps FFT bin magnitudes to the Bark frequency axis, used by audspec.m. fft2melmx.m - generates a matrix of weights to convert FFT magnitudes into Mel bands, just like fft2barkmx above. rastafilt.m - filter each frequency band (now in terms of log energy) with the RASTA filter. postaud.m - fix-up the auditory spectrum with equal-loudness weighting and cube-root compression. dolpc.m - convert the auditory spectra directly to LPC coefficients via Levinson-Durbin. lpc2cep.m - convert LPC coefficients directly to cepstral values. lpc2spec.m - convert LPC coefficients back into spectra by sampling the z-plane. spec2cep.m - calculate cepstra by taking the DCT/DFT of the log of a set of spectra. hz2bark.m - convert frequency in Hz to the auditory Bark scale. bark2hz.m - convert back from Bark units to frequency in Hz. hz2mel.m - convert frequency in Hz to the auditory Mel scale (either Slaney's or HTK mapping). mel2hz.m - convert back from Mel units to frequency in Hz. lifter.m - apply (or remove) weighting from cepstral dimensions. deltas.m - calculate delta features over a limited window, just like feacalc/calc_deltas etc. process_options.m - Mark Paskin's utility to parse long 'name', value pair lists (which I found out about through Kevin Murphy's KPMtools), used by melfcc.m. cep2spec.m - inverse of spec2cep, undoes the DCT. invpowspec.m - invert powspec.m i.e. go back from an STFT magnitude to a (noise-excited) time waveform. ispecgram.m - precisely invert the short-time Fourier transform performed by specgram, taking the same argument (but fudges inverting the window at the moment). invaudspec.m - invert audspec i.e. expand the condensed, nonlinear frequency axis to the full FFT detail. Intrinsically lossy, but does its best. invpostaud.m - undo the weighting and compression of postaud, mostly lossless except the very edge bands are lost. You can download the complete set of routines above as rastamat.tgz (a gzipped tar file). This example calculates 20th order MFCC features (as close as I can get it to the features we distribute for the uspop2002 Music IR dataset) and then turns them back into audio - pretty weird sounding! /usr/bin/mpg123 -2 -m -n 1150 -q -w /tmp/tmp950.wav "thompson_twins--Into_The_Gap--Hold_Me_Now--3.mp3"
% Notice how spectral detail is blurred out e.g. the triangle hits around 6 kHz are broadened to a noise bank from 6-8 kHz. The de-facto standard Matlab implementation of MFCCs for Matlab is the one in Malcolm Slaney's Auditory Toolbox. This version has been verified to give (nearly) identical results, but offers flexibility to adapt to different bandwidths, sampling rates, etc. An alternative Matlab implementation of PLP and RASTA can be found in Fernando Santos Perdigão's Auditory/Cochlea Toolbox. 2012-09-03: Added 'useenergy' flag to overwrite C0 with log(E) (thanks to Ines Ben Fredj); fixed bug with equal-loudness mapping in rastaplp.m. H. Hermansky, "Perceptual linear predictive (PLP) analysis of speech", J. Acoust. Soc. Am., vol. 87, no. 4, pp. 1738-1752, Apr. 1990. 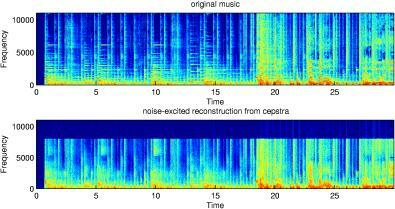 H. Hermansky and N. Morgan, "RASTA processing of speech", IEEE Trans. on Speech and Audio Proc., vol. 2, no. 4, pp. 578-589, Oct. 1994.